Katie Derham presents a lively mix of music, conversation and arts news, including live performances by the Villiers Quartet and the English Touring Opera. Plus Sir Thomas Allen. Katie Derham presents a lively mix of music, conversation and arts news, including live performance from the Villiers Quartet ahead of a rendition of rarely played work by suffragette and composer, Ethel Smyth at St John's Smith Square this Sunday. 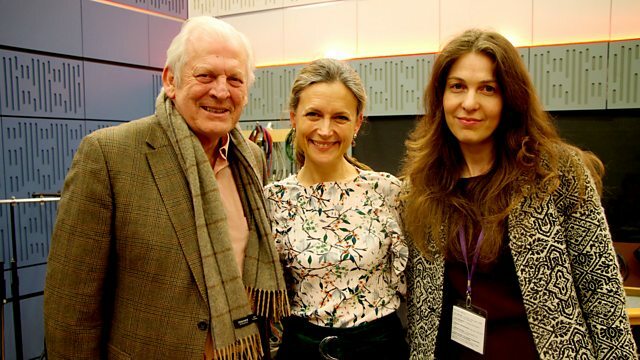 We hear from Sir Thomas Allen ahead of his performance in Cosi Fan Tutte at the Royal Opera House, which opened yesterday. And English Touring Opera join us to perform live in the studio and talk about their Spring Season. Singer: Thomas Allen. Orchestra: Orchestra of the Royal Opera House, Covent Garden. Conductor: Colin Davis. Singer: Hillevi Martinpelto. Singer: Alison Hagley. Singer: Thomas Allen. Conductor: Sir Simon Rattle. Orchestra: Orchestra of the Age of Enlightenment. Performer: Bogdan Vacarescu. Performer: Julian Jacobson. Performer: Mark Bennett. Ensemble: The Purcell Quartet. Performer: Nils Mönkemeyer. Orchestra: Bamberg Symphony Orchestra. Conductor: Markus Poschner. Performer: Galina Averina. Performer: Paul McKenzie. Singer: Montserrat Caballé. Singer: José Carreras. Singer: Valerie Masterson. Orchestra: London Symphony Orchestra. Conductor: Gianfranco Masini.